School officials, municipal leaders, lobbyists and interested onlookers gather in the Legislative Office Building to hear four individual bills that would change the way education is funded. 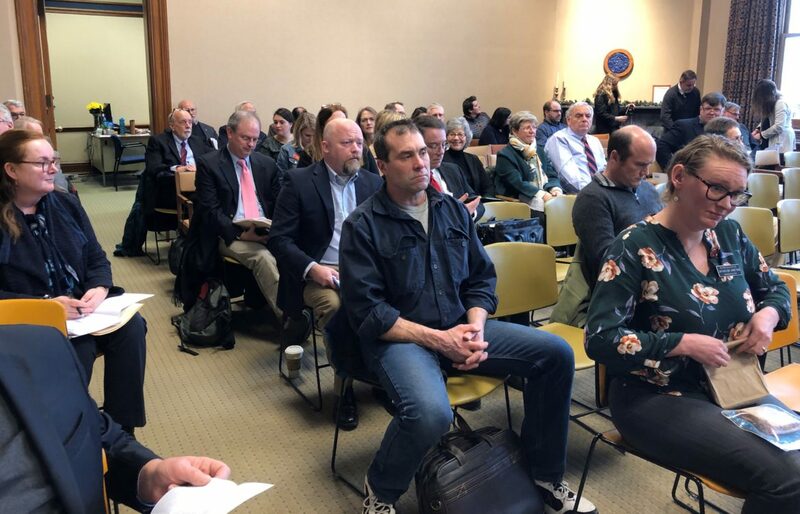 CONCORD – Changes in the way the state raises money for education and distributes it back to communities drew large and sometimes emotional crowds to multiple House committees on Tuesday. House Bill 678-FN is a Democratic effort that, if passed, would almost triple the amount of money provided for an adequate education from $3,561 per pupil to $9,929. It would add $802 per student for transportation costs. While it came first in Education Committee Chairman Mel Myler’s order, it elicited emotional testimony about education revenue inequality and how that leads to students in different communities getting disparate educations. The fiscal note says the bill would add $1.129 billion in expenditures in fiscal year 2020, which begins on July 1, 2019. Identified revenue sources include the state education trust fund and local revenues. MacLeod is a pastor in the Kearsarge Regional School District area and ministers to people in lower property value Newport and the higher property tax value town of New London. “I encourage the Education Committee to level the playing field by making real and fundamental changes (in the way education funds are distributed),” he said. Berlin Mayor Paul Grenier, who supports HB 678-FN, said if passed it would become effective immediately. His school district has a $700,000 shortfall even after closing the last elementary school in the city. “We cannot survive another year,” Grenier said. The Ways and Means Committee heard testimony on HB 686-FN, which would levy a capital gains tax in addition to an existing five-percent tax on interest and dividends that would raise $94 million to provide a one-time payment to school districts. That would restore the 12 percent of stabilization grant income lost to school districts from 2012 to 2019. If passed, the measure would adjust upward the base adequacy per student from $3,708 to $4,500. It would also adjust differential aid upwards for students who qualify for free and reduced lunches, special education and English language learners. “This is a giant step forward,” said Rep. Joelle Morton, D-Hillsborough, saying the funding would relieve the upward pressure on property taxes. Dan McGuire of the Granite State Taxpayers saw it differently. “(It’s an) attack on business creation,” McGuire said. He and Rep. Jess Edwards, R-Auburn, expressed concern that wealthy state residents who profited from investments and capital gains could relocate to a state where capital gains are not taxed like Florida or Tennessee. McGuire said it could discourage the movement of new and venture capital into New Hampshire businesses. Altogether the Education Committee heard testimony on four education funding bills from a total of 24 co-sponsors from both sides of the aisle. They all seek to accomplish the same thing – increase to some degree the level of funding that reaches local school districts. House Bill 709-F, has wide bipartisan House support and includes senators from both sides of the aisle. It seeks to re-institute the concept of fiscal capacity disparity aid, which adjusts the amount a school district gets from various state and local sources according to the equalized value of the taxable property base. Equalized value is the total value of taxable land in a community divided by the number of students in kindergarten through grade 12. If passed, it would also address the disparities associated with rural versus urban transportation costs and require school district accountability. It would eliminate stabilization funds, which have been distributed to school districts since 2012 to offset the funding lost when disparity aid was discontinued by the legislature in 2011. Since 2015 and by legislative design, stabilization funds have been diminishing by four percent annually. Earlier this month, community leaders from all over the state, most of them from lower property value towns like Franklin, Berlin and Newport, told members of the Education Committee that the continued and gradual loss of funding spells disaster for their students. At the same time, Executive Councilor Andru Volinsky of Concord, and Attorney John Tobin have been traveling the state championing a return to disparity aid funding. Volinsky, who has hinted at a 2020 run for governor, and Tobin were two of the lead attorneys in the landmark New Hampshire Supreme Court education funding cases known as Claremont I and Claremont II. Volinsky supports House Bill 551 that, if passed, would create a commission to study education funding and appropriate $500,000 to support its mission. The bill is scheduled for a public hearing Wednesday at 10 a.m.
“The very fact that four different funding bills are on the table indicates that we need a good study supported by nationally known school finance experts so that we all know how much an ‘adequate education’ costs and the best way to direct state aid to support all schools,” according to a legislative alert issued by Volinsky and Tobin. 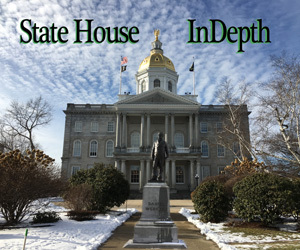 House Bill 711-FN is a second measure proposed by Democrats and it would increase the base level of adequacy aid per student to $4,900 per pupil in municipalities where the population is 7,000 or greater, to $5,600 per pupil in towns with populations between 4,000 and 7,000, to $6,300 per pupil in towns with populations between 2,000 and 4,000 people, and to $7,000 per pupil in towns of less than 2,000. House Bill 713-FN is a largely Republican effort to adjust the amount of adequacy aid per pupil from $3,561.27 per student to $3,897. It establishes a grant fund that would include additional per-pupil funding in communities based on a formula that incorporates equalized property value per student with higher grants awarded to communities of lower value. HB 713-FN would repeal stabilization aid, allow individual school boards to establish transportation policies, including eliminating a district’s responsibility to provide transportation. It’s the result of about 20 meetings of a committee over the summer to adjust the amounts to provide for education, said Rep. Kenneth Weyler, R-Kingston. He said it takes into consideration 10 years of inflation and adds more aid on a sliding scale to the low-value property communities. Bill sponsors also believe that there is the local tax base to support this measure that does spend more on adequacy. “We all feel we give you a bucket of money… and we don’t currently have any kind of accountability,” said former representative Karen Umberger, a Republican from Conway, who served as chair of the committee. One of the main goals, she said, was to get more money to the lower property value communities and to create some transparency about how the money is spent.